What would an Italian Christmas be without Struffoli? It certainly would be lighter, that’s for sure! These little things are addictive, calorie filled, baby bombs of deliciousness and they are only permitted in my household at Christmastime. Why? Because there’s no restraint around them, so best to not make them too often! As I love baking, I am always trying new things, inventing new desserts, consulting with mom (of course!) on what might work and what not, but there are a handful of staples you can’t mess around with at Christmas. Of course, got to have some biscotti, anise cookies, the pizzelle, butterballs, a jam crostata and the struffoli. Anything more than that and we’re just being greedy, which, of course, we are, no reason to hide it. Thankfully, the New Year is right around the corner and we all promise we will do better in the New Year, right? Ha! These are not so hard to make, but the do require a bit more work than some of my lazier recipes. But they are worth the effort, if only once a year. These are festive and are only generally prepared around Christmas. While any weekend is worthy of a crostata or quick anise cookies, these are saved for just this time of year. So put aside an hour or two this holiday season and make your family some delicious Struffoli! Cutting the pieces of dough. Warming up the honey! The best part! I say a cup in the recipe, but you can use more, if you like. 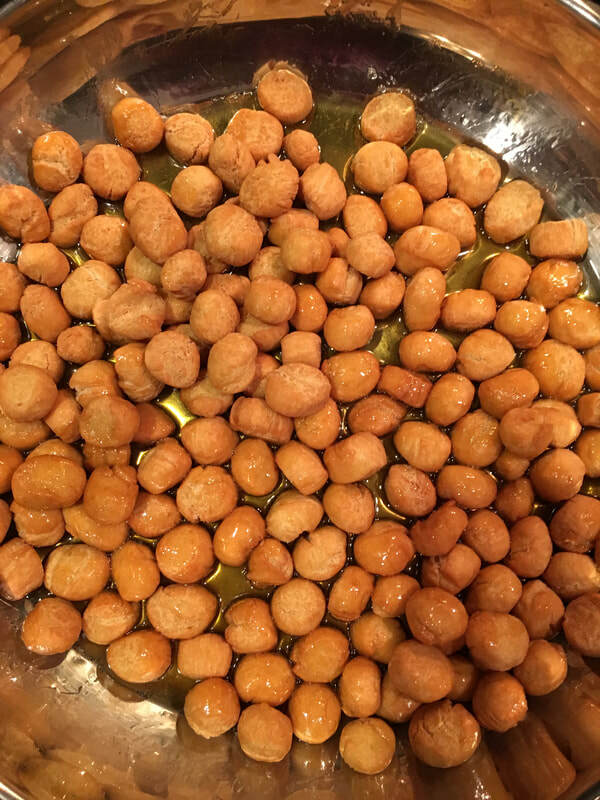 Carefully coat the little balls of goodness in honey, Yum. Start by melting the butter, either in the microwave or stovetop, and set aside to cool off. While the butter is cooling, prepare a large frying pan by filling it ¾ up with vegetable or peanut oil. To start off, mix all ingredients with a whisk. 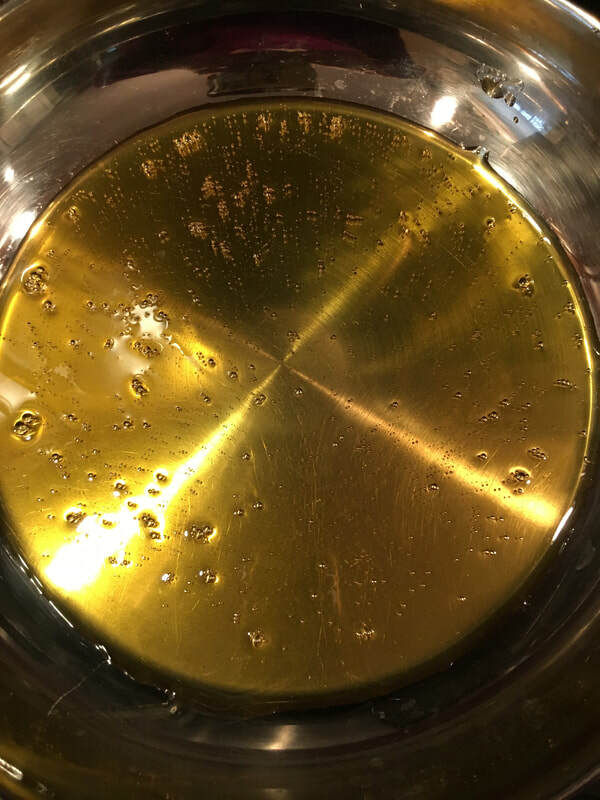 When the ingredients have started to come together, transfer the batter to a counter and continue working it with your hands until dough comes together fully and resembles a ball of pizza dough. Depending on the size of the eggs, the dough may be a bit soft, if so, add the rest of the flour you have reserved. Wrap dough in a clean kitchen towel and let it rest at room temperature for 30 minutes. 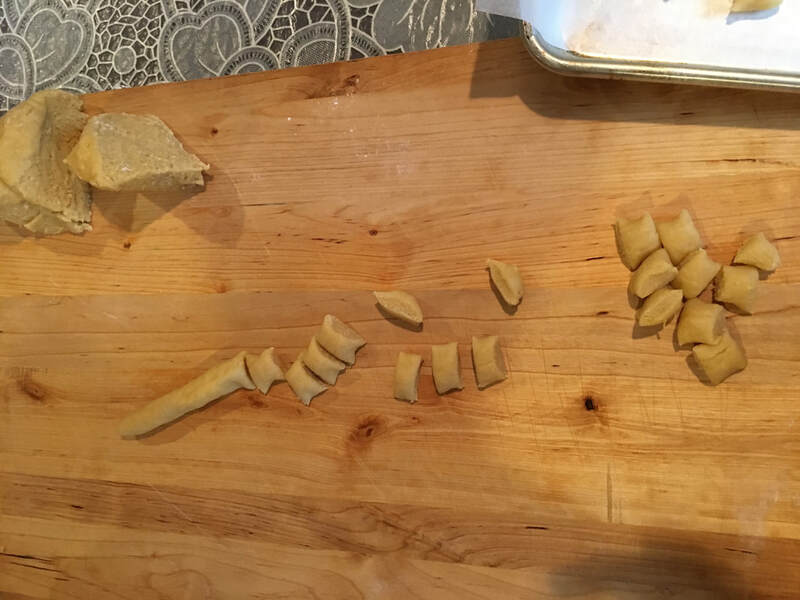 After it has had some time to rest, divide the dough into 7 – 8 pieces and roll each piece into strands that are approximately 18 inches long and 1 inch round. 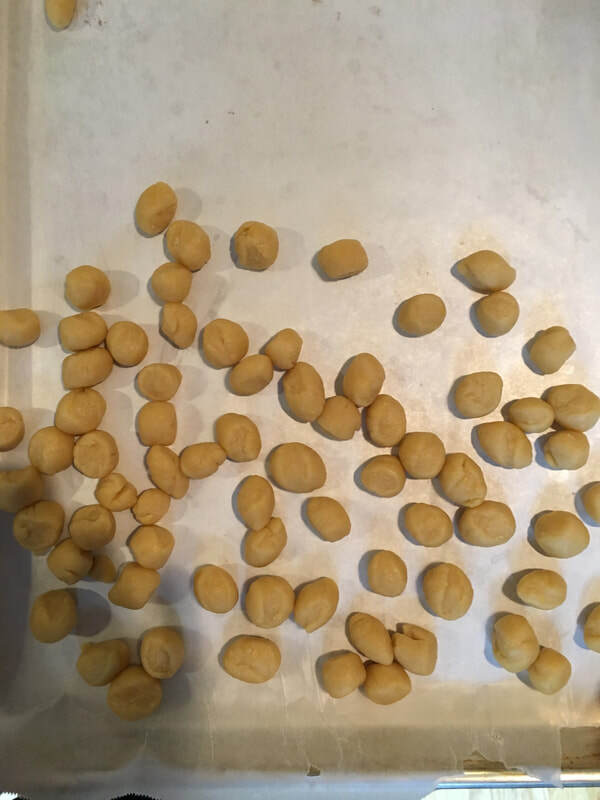 Cut off pieces of dough into small rounds resembling marbles. Continue with the rest of the dough. 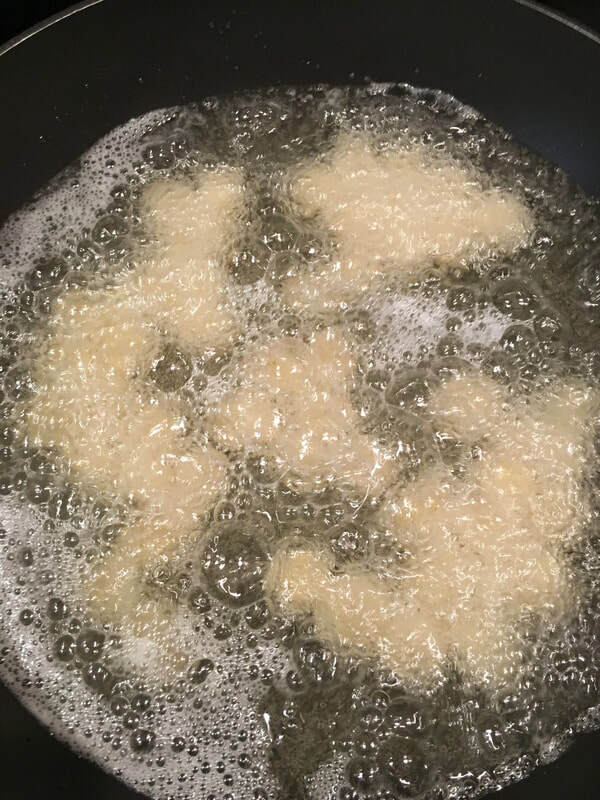 After all the dough has been cut into small pieces, heat the oil to 350 – 375 degrees (use a frying thermometer if needed) and using a strainer or slotted spoon carefully drop some of the struffoli into the oil, being careful not to overcrowd the pan. Fry struffoli for approximately 2 – 4 minutes, until they are all uniform in color. They should be neither too light, nor too dark. 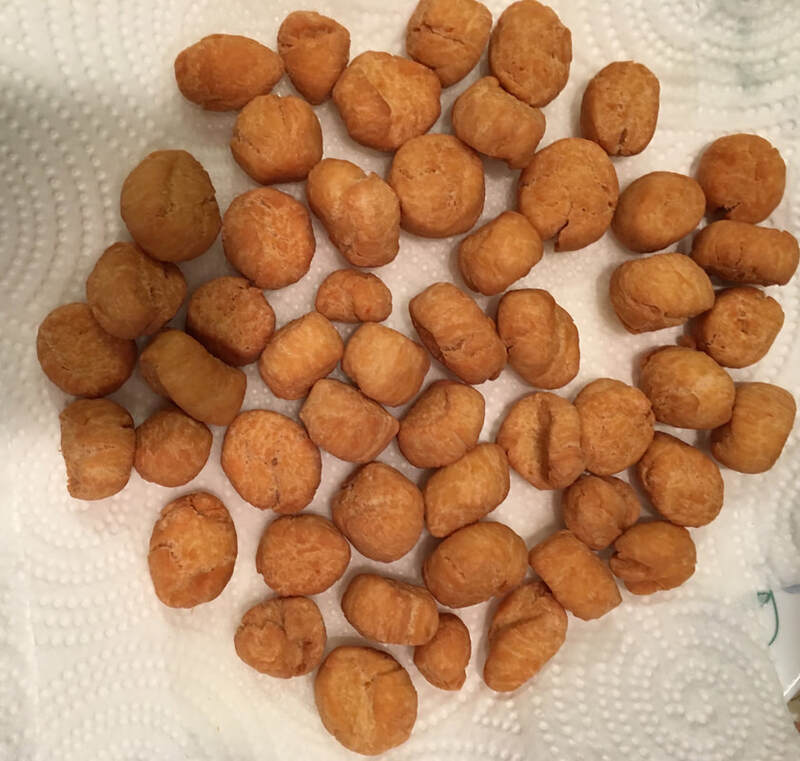 Transfer fried struffoli to a cookie sheet that has been lined with paper towels and continue frying the rest of the struffoli. After all the struffoli have been fried, prepare the honey. In a large sauté pan set over medium temperature, heat the honey until very warm but not boiling. Carefully add the struffoli to the warmed honey and using a rubber spatula or wooden spoon, gently coat them with the honey until well coated. Turn the heat off and transfer to serving bowl. Add decorative sprinkles, as desired. Editor’s note: ISDA’s “12 Days” run from Dec. 14-Dec. 25 to promote Italian and Italian-American traditions, art, literature, stories and more. Per the Christian calendar, the actual 12 Days of Christmas are celebrated from Dec. 25 to Jan. 5.